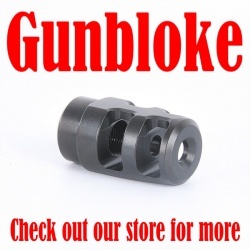 "THE NULLIFIER" Muzzle Brake & Compensator provides maximum recoil reduction & muzzle jump compensation. The result of extensive research into muzzle gases and the effects of redirecting them for recoil reduction and accuracy enhancement. 2 large expansion chambers plus top venting trap and redirect gases to eliminate dust printing, muzzle rise, and back blast. 2 large baffles, each featuring open top ports redirect a massive volume of gas away from the bore axis whilst reducing muzzle jump.